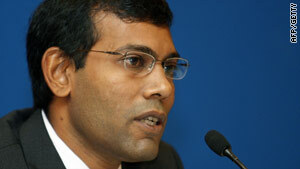 Nasheed: U.S. President John F. Kennedy chose to go to the moon. Our generation must choose to remain on planet Earth. (CNN) -- In September 1962, at a rally at Rice University in Houston, Texas, President John F. Kennedy told the American people: "We choose to go to the moon." The speech set out Kennedy's historic vision for American involvement in space. At the time, the United States did not possess the knowledge, had not acquired the expertise or fully budgeted the money to make the pledge a reality. Yet Kennedy's bold announcement inspired a generation of Americans to make the seemingly impossible, possible. Seven years later, Neil Armstrong and Buzz Aldrin took their famous first step onto the lunar surface. As world leaders prepare to leave for the Copenhagen climate change talks, to tackle the great challenge of this decade, we need a global vision equal to Kennedy's. Sadly, this political leadership is lacking. Climate change is happening faster and with greater severity than anyone predicted. In the past couple of decades, a quarter of the North Pole has melted, Australia has been afflicted by near-constant deadly drought and pests are wreaking havoc in warming North American forests. The G8 group of rich countries has pledged to hold temperature rises to two degrees Celsius and atmospheric carbon pollution at 450 parts per million. Events on the ground now prove that this commitment is inadequate. With so much havoc being caused by less than one degree of warming, why would we aim for two? The world's top climatologists, such as James Hansen at NASA, state that carbon concentrations in the atmosphere must be reduced from today's level of 387ppm, to a safer level below 350ppm if catastrophic and irreversible climate change is to be averted. To hit this planet-saving target, transformative change is required. The Maldives -- a low-lying island nation, just one-and-a-half meters above the Indian Ocean -- sits at the climate change front line. The Maldives is, nevertheless, trying to show the way by becoming carbon neutral in 10 years, transforming its fossil fuel economy to one based solely on renewable energy and green technology. Since announcing the carbon neutral policy in March this year, the Maldives has undergone something of an environmental enlightenment. We have signed two agreements with international energy companies to build large wind farms; investors are proposing to turn our garbage into green electricity; and some of our famed luxury tourist resorts have pledged to become carbon neutral themselves. Local people have been energized into action, with individual islands declaring carbon neutral targets of their own; green investors and entrepreneurs are flocking to the Maldives; and it is now apparent that renewable power plants will provide cheaper electricity than existing diesel generators. Many of these developments were not envisaged when we made the carbon neutral pledge and have come as pleasant surprises. The lesson emerging from the Maldives is that when leaders set out a clear vision, individuals, investors and entrepreneurs follow, creating a virtual circle of positive change. We need to create this momentum on a global scale. If leaders fail to act now, the climate crisis will become a catastrophe, threatening the very existence of human civilization. But if we show historic leadership, we can avert the crisis and create a greener world, richer and more exuberant than the one we inherited. Kennedy chose to go to the moon. Our generation must choose to remain on planet Earth.